Our very own VF-UK team member Jess reflects on her journey to being in her very first a cappella group, her role within VF and more! It’s no secret that I love a cappella. It originated through late night YouTube searches of my favourite songs, but when I moved to London for university, I was introduced to a whole new world – a bubble of a cappella, if you will. Attending the Voice Festival weekend in 2014 and seeing so many incredible groups not only competing against each other, but also bonding as part of a community cemented it in my mind – I wanted to be part of a group myself. But where did I start? I didn’t know anyone crazy enough to start a group with me, and I wasn’t sure how to do it by myself. I knew I wanted to be involved in any way I could, so I joined the Voice Festival team in June 2014. We published a guide a few months later on how to start your own a cappella group (which you can see if you click here), which included a list of questions to consider such as group size, group name etc. Reading it made me want to start even more! In October 2014, a girl posted on a Kingston University Society page on Facebook saying that she wanted to start up an a cappella group. I couldn’t believe it! I contacted her straight away, and soon, The Kingstones was born. We initially tried to start as soon as we had enough people (around six), but due to scheduling conflicts and commitment issues with some members, we stopped and retried at the beginning of this year. We’ve definitely hit roadblocks – deciding a name one of the big ones! – But on Wednesday 11th March we had our first public performance as a part of our University’s Global Week. Some of our group had never performed in front of a crowd before, so naturally we were nervous, but we all had loads of fun and the crowd were really supportive, too. I’ve taken on the role of media manager in which I manage all of our social media accounts (@KUKingstones and The Kingstones on Facebook, go follow/like us, yeah?) and make decisions on things such as logos, t-shirts etc. although we all help each other out, too. We sing such a wide range of music – from The Muppets to Hozier – which means that there’s never a dull moment in rehearsal! We’re already planning our next performance opportunities, and we can’t wait. Joining a group and getting involved with VF-UK has been one of the best decisions I’ve made. It has not only enriched my university experience, but also taken me to places I would never have visited, opened me up to new experiences and challenge my leadership skills, too. The recent Festival Weekend in Birmingham was such an incredible whirlwind. I’ve never been involved in something as big as this before, and even though it was hectic and so fast paced with 400 things happening at once, I loved every second of it. It actually made me a little bit emotional to see so many diverse, talented, wonderful people all in one place celebrating each other’s successes. The level of talent this year was insane, and I can’t wait to see how the UK a cappella scene progresses. If you’re considering either starting or joining a group, or even just getting more involved in the a cappella world – my advice? Do it! The VF-UK Bristol Regional Festival – by a Bristol Suspension! This is a guest post from Joe Pickin, member of the brand new Bristol-based group The Bristol Suspensions. 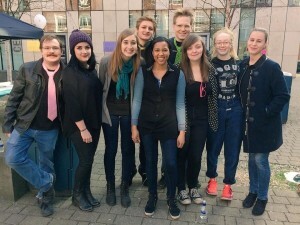 The group recently enjoyed their first ever concert as part of the Voice Festival’s Bristol Regional Festival, and Joe here tells us a little bit about what the group learnt on the day. Recently I had the opportunity to attend The Voice Festival’s Bristol Regional Festival on Saturday 22nd November as a member of The Bristol Suspensions. It was a fantastic day for all involved and we really felt welcomed into the a cappella community. 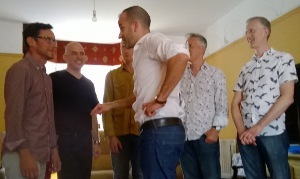 The day began with a brilliant workshop led by Paul Davies, a highly experienced vocal coach specialising in the barbershop style. In the two-hour session he stripped vocal technique back to basics, focusing on posture, production of sound, and resonance. One of the most valuable things we learnt from him was that you should always prioritise singing, and although beat boxing and choreography are very entertaining, good singing is the most important part to the audience. 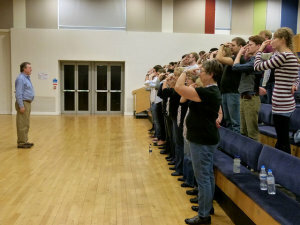 He then continued by coaching a few of the groups “under glass”, including Aquapella and Semi-Toned. Each group sang a song and then Paul suggested some ways to improve before they sang it again. It was impressive to see how much you can improve with only 10 minutes of coaching! Finally everyone learnt an arrangement of “Higher and Higher” (in only half an hour!) to sing in the show later that evening. 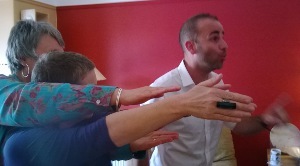 We had an awesome time, and all of us in the Bristol Suspensions would like to thank Paul for all of the valuable vocal lessons he taught us that afternoon. All groups who participated in the workshop were invited to perform in the evening show. 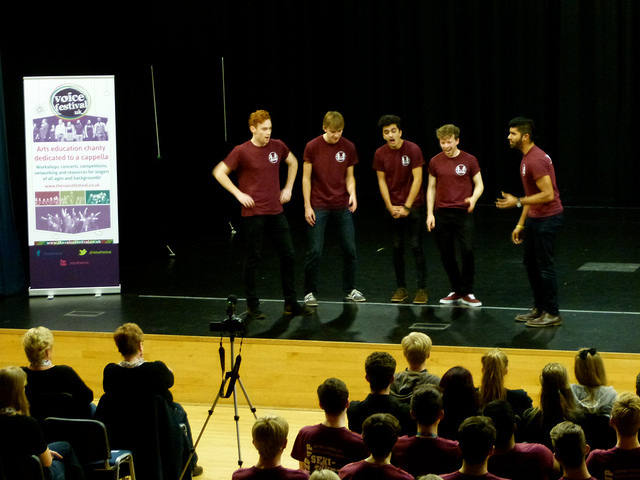 For the Bristol Suspensions, an a cappella group set up in October, this was going to be our first ever concert! We were very excited to be part of such a great event, but were also slightly nervous. Thankfully the show was a great success and we had a lot of fun. Personal highlights include Aquapella’s rendition of “Toxic” by Britney Spears, and Semi-Toned’s hilarious medley of Christmas songs. Despite the short rehearsal time “Higher and Higher” sounded fantastic and was full of energy. After the show was a brilliant opportunity to network with the other groups – we’ve already got a joint show with Bath’s Aquapella planned for next year! The Bristol Suspensions would like to thank the Voice Festival for organising the event and especially Zoe who I know worked tremendously hard to make the day such a success. I’d urge everyone to get involved in a Regional Festival – it’ll be a day you won’t forget! 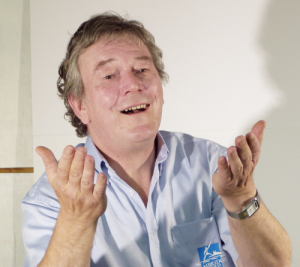 Bristol Regional Festival – meet workshop leader Paul Davies! With only a few days to go until our Bristol Regional Festival, we took a few moments to get to know our leader for the afternoon workshop, Paul Davies. We’re delighted to have him on board and can’t wait to see him work his magic with our participating groups! It’s been non-stop from about the age of five when Mum, Dad, my sister and I used to attempt four-part around the kitchen table. I was in a cappelIa groups at school and as a cathedral chorister, then joined the Barbershop Association where I’ve been a Music judge for almost 30 years. The most thrilling moment was winning Choir of the World and the Pavarotti trophy with Cambridge Chord Company, a vocal group I started as 12 mates singing in the back room of a pub. What is your all-time favourite a cappella or barbershop arrangement? Oh gosh. Since it’s nearly Christmas let’s go for Pentatonix “Little Drummer Boy”. A supreme example of how to take a simple song and turn it into a masterpiece through imaginative arrangement, creative use of dynamics and vocal colour, subtle VP, perfect tuning and balance, and entrancing facial expressions. The YouTube video is dubbed but who cares? If it can draw… let’s see… 30,010,017 people to a cappella that can only be a good thing. Can you give us a hint of what we might expect from your workshop on Saturday? The central message is that good vocal technique is essential whatever your style. We’ll be looking at basic vocal craft and how to maintain it through demanding stage routines. I’m also hoping to do “coaching under glass” with any established groups who come to the workshop. We’ll also face the ultimate challenge – learn a choreographed song in half an hour and perform it on the evening show! That’s all for now, but if you like what you hear and are dying to find out what Paul can teach you, don’t hesitate to come along to the workshop. It’s open to the general public and you’ll get the chance to sing with some fantastic a cappella groups (you can find out a bit more about them here). Tickets are still available, and there will be a limited number to purchase on the door – click here for prices and payment options. 1. It might spark some ideas – whether you have never sung a cappella before or have 30 years’ experience you’re probably looking to do something new – this might help you work out what that is. It might inspire you to help out – be that by producing your own arrangement and video for others, or by creating a brand new group – do get in touch with us by emailing resources@thevoicefestival.co.uk if you’re interested. 2. Our first arrangement is sung by the fabulous In the Smoke – one of the community groups who sang at our showcase in January – they’re brilliant. The arrangement is really, really good – we’re not putting something out there that’s second rate, we challenge your group to make it sound bad! And you’ll be able to correct those misheard lyrics in your head – the words to Bullet Proof and Titanium are definitely what we thought they were! 3. It’s an opportunity to give us a bit of feedback – have a watch, give our guides a read, and tell us what’s good and what you’d like next time. The VF-UK have an enormous amount of combined expertise, and are always on the lookout for new ideas and challenges. 4. You can use it as inspiration to record your own video – if you have a new arrangement that you want to share with the world, then upload it and reach new audiences! Get in touch with us on Facebook or Twitter to start up some a cappella chatter. 5. It’ll whet your appetite for some of the workshops and performances at the Festival Weekend, Birmingham, in April 2015. We can’t wait to hear brand new groups, new talent that you’ve dug up from your schools, universities and local areas, and your exciting new arrangements! Access our Resources page here, and tell us what content you’d like to see at @thevoicefestival.co.uk. Groups often find running auditions nerve-wracking. What if no one shows up? What if we get lots of wannabe X Factor divas? What if they aren’t suited to a cappella? What if they think we are rubbish and they’re too good for us? What if the new people steal all my solos!? Remember that, like a job interview, it’s a two-way process. You are responsible for making sure the process is fulfilling for all parties. An a cappella group that likes spending time singing together, irrespective of prior training, musical taste, favourite football team etc., is a successful a cappella group. This guide lists some things to consider – it’s by no means exhaustive, but is hopefully a help to those feeling like they don’t know how to start as well as those perhaps jaded by having been through the process a few too many times. With thanks to Melissa, Hazel, Ian and James of In the Smoke for their helpful contributions. We have a handful of superb new team members, a shiny new competition, a new location for the Festival Weekend, and a whole load of aca-events to get stuck into for 2014-15. Time to get excited! 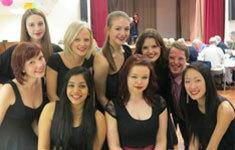 VF-UK at Ed Fringe: The Vocalites! 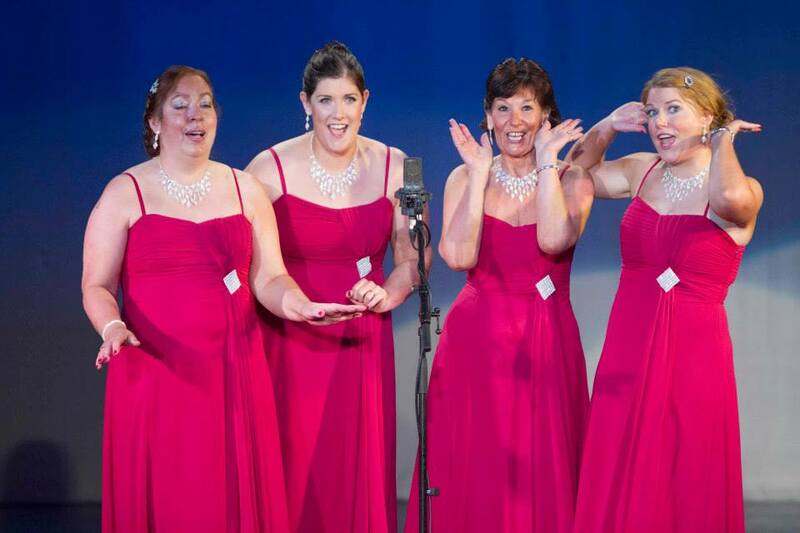 Next up in our series of spotlights on our fabulous Fringe Festival performers is a peek at the ladies four-part community a cappella group The Vocalites. They share some of their favourite moments from the last year and tell us what lies ahead for the rest of 2014! Remember, the VF-UK workshop and a cappella showcase – featuring the Vocalites and much more – takes place at Greyfriar’s Kirk, Edinburgh, on the 8th August, and there’s still time to grab your tickets. Don’t miss out! Tell us a bit about your group. Where are you from? When did you start singing together? There are 4 people (of course!) and they have been together for about 4.5 years. They are Alicia Tindal (lead), Juliet Erskine (tenor), Kate McGeoch (baritone) and Jacqui King (bass). Last year they sang in the Spiegeltent at Edinburgh Literary Festival and in the Mitchell Theatre in Glasgow amongst other venues, and competed in Llandudno and Bangor, N.I. The Vocalites are part of the choir singing for the baton relay celebrations at both Inverary and Dumbarton Castles this month, and have recently won through to the semi finals of this year’s Ladies Association of British Barbershop Singers (LABBS) national competition so will be heading down to Harrogate in October for that. They also hope to be in the finals of Scottish Power’s Got Talent, but that has yet to be decided! Is this your only appearance at the Fringe, or will you be performing elsewhere? They won’t be appearing anywhere else in Edinburgh, sadly, but are looking forward to their appearance at the VF-UK Edinburgh Fringe Showcase this year. Man Band – Let’s Get Guys Singing! Here’s a story that will warm the soul – one man’s bold and inspiring vision for boosting a cappella singing inside and outside of the classroom. Drop us a line if you have stories to share of how a cappella is growing in your schools and communities. In September 2011 I joined The Queen Katherine School in Kendal as a teacher of music and then was fortunate to become Head of Department in September 2012. One of my aims for the department was to develop the extra curricular programme and try and encourage more lads to get involved with singing. The department already had a strong singing culture but there was a lack of guys singing in the choirs on offer. I already had a strong interest in a cappella singing; I had been fortunate enough to see the Swingle Singers and The Real Group in concert and had attended a workshop with the Swingle Singers. I am also a big fan of American male a cappella group Straight No Chaser. Therefore, I planned to start a new group in September 2012 that would be a male a cappella group. As for a name, the only thing that I could think of was Man Band! I did envisage this name to be changed by the lads in the future but it seems as if the name has been a hit and it has stuck! 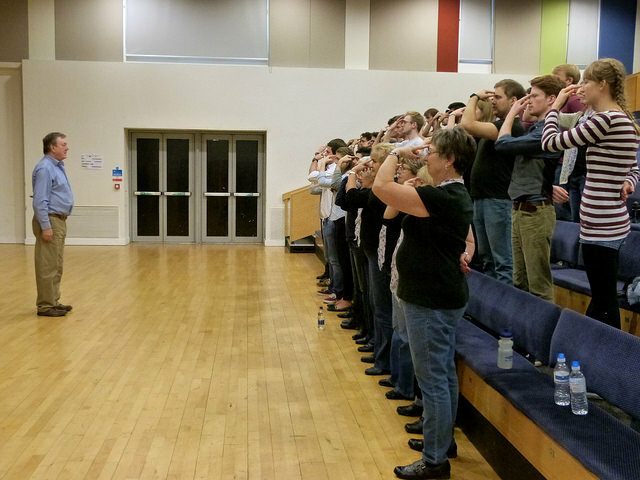 I started by bringing the ‘classics’ to rehearsals; Lion Sleeps Tonight, In The Still of the Night etc. Things were going well but there wasn’t really a spark or buzz that I wanted. I then decided to scrap these songs and start making my own arrangements. The charts that I had been bringing were quite challenging and I had brought with me a lot of sheet music that I had bought. However, over half the lads involved can’t actually read music all too well and so sheet music actually became an obstacle. Also, I wanted the lads to get their heads out of the music in front of them and perform and focus on listening to what they are producing rather than seeing if they are singing the correct note on paper. Therefore, I started with an arrangement of I’m Yours by Jason Mraz. As I had to take into account that more than half of the group could not read music too well, I had to make the parts accessible for all, challenging for those more accomplished singers and yet at the same time, when put together, sound like the entire piece was the most complicated and refined a cappella piece of music there was! As soon as I brought this song to the group and as the lads began learning the individual parts, the buzz that I wanted grew and suddenly it clicked. Soon enough the lads were performing in their first concert in October and they were a hit! Moving on from this first performance we have now worked on arrangements of Fix You by Coldplay and a mash up of Just the Way You Are by Bruno Mars and Stand By Me by Ben E. King. As always, the arrangements are ones that I create with the lads in mind; in effect, the music we sing is differentiated for all abilities in the group! We have performed in all school music concerts and have performed on two occasions for the Kendal Town Mayor. We are booked for another Mayor’s event in July and we are also planning a flash mob at our local shopping centre. I am working on two new arrangements, Wonderwall by Oasis and I Need a Dollar by Aloe Blacc. I am also now using software like Sibelius when writing these arrangements so that in rehearsals, using a projector and speaker the lads can sing along with their part and the more advanced musicians can actually read the music. Man Band has been a real success and a tad selfishly, a dream come true for me. We now have 26 lads in the group, three members of staff and even the head teacher who comes down every now and then. I am fortunate to have Kevin Bell (a DT teacher and member of Man Band) who manages publicity and bookings and having this manager and director ‘kind-of’ system gives the group a little more professional feeling, which the lads like as it makes the group feel more than just a ‘school group’. What is next for Man Band? Well, the lads can now sing together and they can sing well with expression. 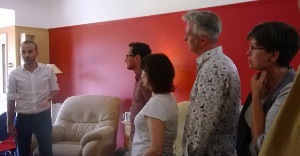 It is now about turning the group into a visual delight as well as auditory delight! We do a lot of standing and clicking at the moment and so some movements are planned for next year. Kevin Bell is going to help the band get involved in more performances and a cappella festivals and we are hopefully going to simply spread the name of Man Band. My overall goal is to make singing fun, engaging and accessible to all. I knew this group was a success when in one of my year 9 music lessons when doing arrangements of the Alton Towers Theme Tune, one of the Man Band members rallied up a group of his friends to create an a cappella arrangement. Yes it was a little silly and rough around the edges, but I could not believe my eyes to see a group of lads who had nothing really to do with singing, trying to create bass lines, drum parts, pitch correctly and sing in front of their class! If this is what comes from Man Band then I am happy!